Neverland London is a new 'urban beach' pop-up for Summer 2017 comprising an outdoor stretch of Thames beach on the North side of the river, south of Fulham and next to Wandsworth Bridge. It'll have streetfood from traders like The Duck Truck, Le Rac Shack, and Taco Dave, plus beach huts and more. It'll be strictly BYOB, but have mixers for you to create your own cocktials. It'll be open Wednesday to Sunday from 10th May - book your spot now! "Neverland London, opens as a BYOB alfresco drinking and street food dining experience with its very own white sandy beach, set within palm trees, pastel painted beach huts, swings and summer cocktails. This affordable drinking experience welcomes people to enjoy the Thameside location with deck chairs and grass seating while covered feasting tables, daybeds and beach huts will be on hand to cater for the British summer. Welcoming parties and larger groups – beach huts can be booked for up to 8 people or one of the beach daybeds for groups of 12 to 25 seated & standing. Cocktail chests are also available with a selection of unleaded mixers to complement the BYO alcoholic tipples. Entry starts at £5 (basically the corkage fee), giving entry and access to any of the free seating from feasting tables to deckchairs. 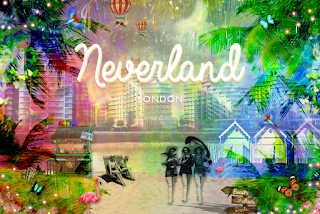 Limited tickets can be purchased on the door or jump the queue by pre-booking ticket on the Neverland London website. Find the perfect spot at Neverland London, a romantic alfresco drink for two under the stars, weekend family brunch in the sun, or friends for a party. Eat, drink and listen to music alongside the river Thames offering affordable, alfresco drinking and dining at its best."